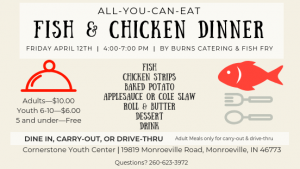 Come to 19819 Monroeville Road on April 12 and experience our annual All-You-Can-Eat Fish & Chicken Dinner! You can choose to dine in and have all you can eat, or you can choose the carry-out or drive-thru options. Burns Fish Fry will be catering, so don’t miss out on this delicious event!